The GPS beeped, the screen flickering for a split second before going dark. Mark let the car drift to the side of the road while I frantically jiggled the cord, pushing the 'ON' button over and over in a futile attempt to get the map back up on the screen. "I think it might be dead." The morning had started out so well. 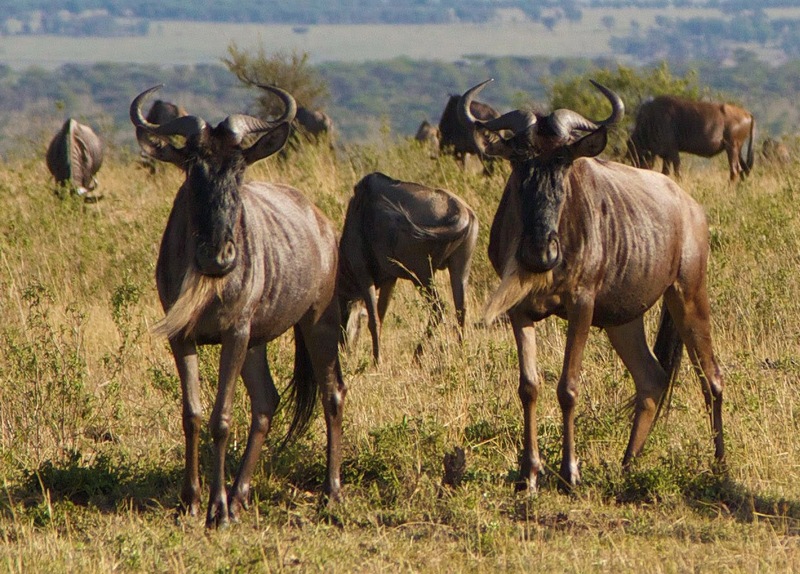 Within a mile of our campsite we had driven right through part of the great migration, watching huge herds of wildebeest roll across the sweeping green plains. We stopped to admire the views from the top of the kopjes as we made our way towards Klein's Gate, the northern-most exit from the Serengeti in Tanzania. We stopped in at the gate to check out of the park and sign the Log Book. Klein's is a lightly used gate, it's far from the more popular parts of the park. Not many people travel through this area; there were only two guards here and both jumped up to greet us. I think they were happy to have someone break up the monotony of the morning. Inside the office, we looked at the map that was tacked up on the wall and asked about the road to Lake Natron. "How is the road? Are there any problem spots?" Both Shaw and our guide book had described some difficult areas on this stretch. When the road is dry, it's just the usual rutted, corrugated stuff to which we had become accustomed. But after it rains, the "black cotton" soil turns to gluey, tire sucking muck, making the going difficult to impossible. Beyond the muddy areas, the road travels through a rocky desert and descends into the Nguruman Escarpment, a volcanic area sharing a border with Kenya. There is a section of switchbacks nicknamed Seventeen Corners that is notorious for it's narrow, acrophobic drop-offs and puckering two way traffic on what should be a a one way road. "Roads are fine. They are good. No problems." We had learned to take what was said about roads here in perspective. Roads that are "good" to natives would have triggered a stack of letters to the city council (and possibly lawsuits) back home. But the fact that they had also mentioned they were mostly dry was a good sign. We could manage the ruts and bumps, but mud would have thrown us a new challenge we weren't sure we were ready to take on. Our rule when traveling in Africa was always "if there's a restroom, use it" so we wandered over that way. I opened the door to the ladies and found this one was equipped with a squat toilet. All the restrooms we had visited to this point had either the western style toilets or a mixture of squats and western. This, being such a remote outpost, was only equipped with one hole, quite literally. 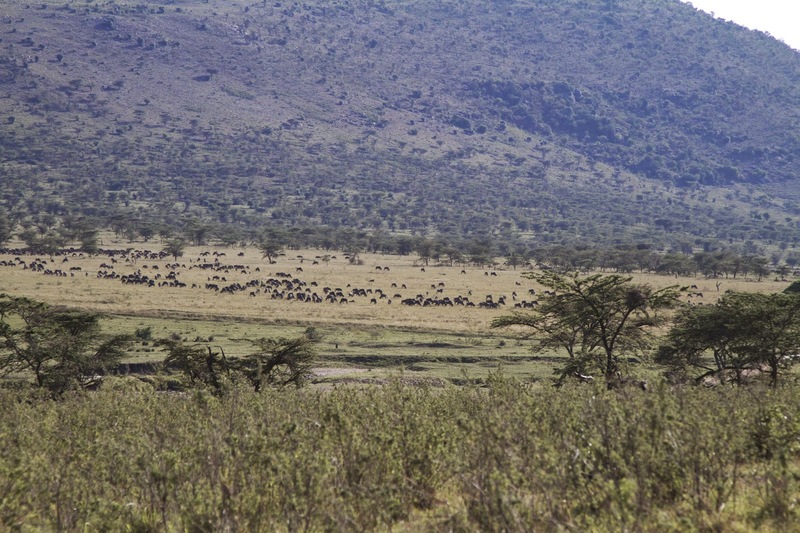 The green color on this side of the park was a refreshing change from the dry brown of the rest of the Serengeti. 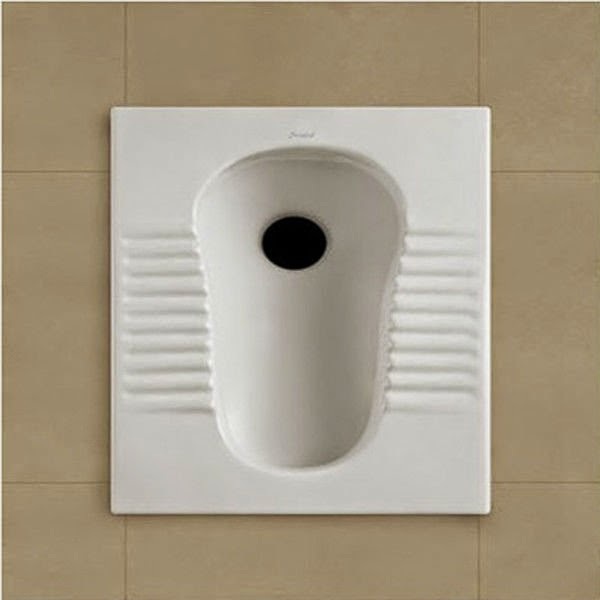 For those unfamiliar with the concept, the squat toilet is a hole in the floor surrounded by a porcelain plate (if it's a fancy one) with two grooved foot pads on the sides. There isn't any toilet paper; for washing purposes a bucket of water is placed in the room with a small bowl meant to dip and pour over your parts and clean up any "excess" on the porcelain. This particular room had a large barrel made by sawing a 55 gallon drum in half. I have to hand it to the guys; the restroom was very clean, unlike most of the others we had visited. Now, I'm up for anything. We had spent the last few days digging our own holes and hiding behind bushes, so a little squatting wasn't going to be a deal breaker. I have a habit of stuffing my pockets full of tissue before we go anywhere while we're camping, so that wasn't an issue. Besides, I would have just hovered over a western-style toilet anyway, so what's the difference? I lined myself up, taking care not to let my shorts drag on the floor. Everything was flowing well and I don't mind telling you my aim was spot on. I had a little trouble getting the tissue out of my pocket while still in a squat; should have thought to take it out before I got started. That was when things went a little awry; as I bent over to pull up my shorts, my sunglasses—which were tucked in the neck of my shirt—started to slide out. Immediately I envisioned them falling down the hole, a place I wasn't willing to go no matter how badly I needed them. As I reached up to grab them they slid out, glancing off the back of my hand and catapulting away, splashing down in the water bucket in the corner. I quickly hobbled over and plunged my hand in the bucket, chasing the glasses as they fluttered down into the water. I caught them before they went too deep; if they had gotten to the bottom I would have been up to my armpit in questionable water. Sunglasses raised victoriously in the air, arm dripping, shirt sleeve wet, shorts around my knees: I was the picture of triumph. Now to figure out how to pull up and button my shorts with only one hand. Back at the car I stood outside the door, not wanting to touch anything until I got myself cleaned up. The water from the restroom seemed clean, but it certainly wasn't to drinking water standards. I had to ask Mark to get out the wet wipes so I could clean up before climbing into the passenger seat. I had trouble explaining my predicament to him because I was suddenly overcome with a serious case of the giggles. While we had been making our pitstop another tour car had pulled in and it's occupants were standing nearby waiting for their driver. I'm sure I was just confirming what this European safari group already knew; Americans aren't fit for polite company. A group of giraffe grazing near the road just outside Klein's Gate. The countryside in this part of Tanzania is absolutely gorgeous. The late rains had kept the hills green and lush; small villages dotted the valleys around us, the herds of cattle here the fattest we had seen the whole trip. 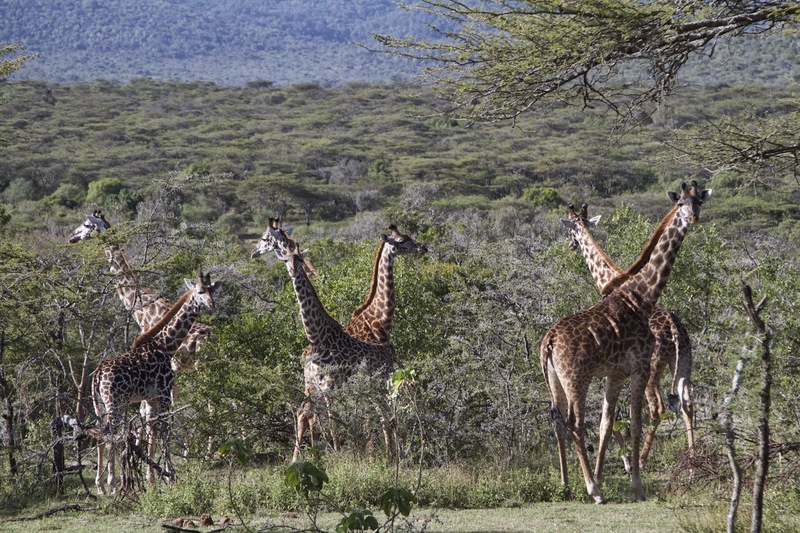 We came across a section thickly lined with trees and were surprised to find a large group of giraffe, munching away. We had been in Africa for over a week now but it never ceased to amaze me that these huge animals were everywhere. Not just relegated to certain areas, but everywhere. It was a thrill to drive, never knowing what might be around the next corner. We traveled through several small villages making our way towards the town of Wasso, the halfway point to Lake Natron. Our instructions from Shaw said we should stock up on food and fuel there, it being the last stop for the next few days. 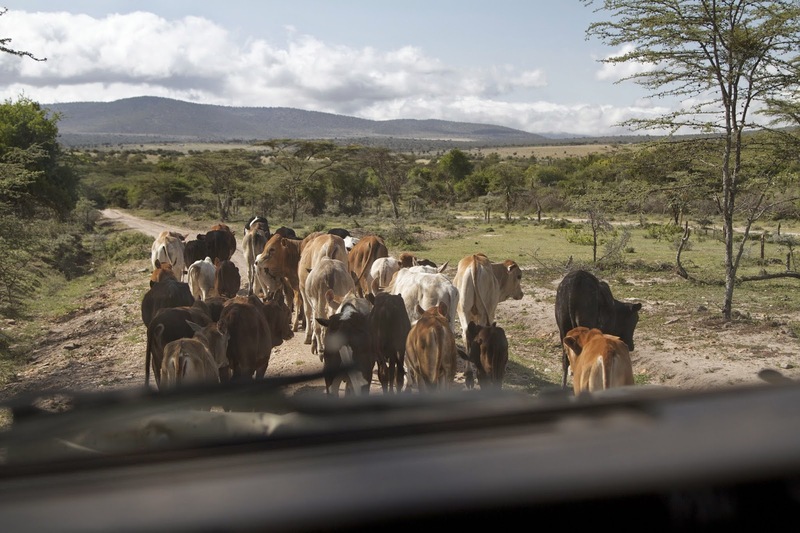 We puttered along, getting stuck in a few Maasai cattle traffic jams, taking in the beautiful scenery. Why, oh why, do the cattle always want to walk on the road? This happened over and over on the road to Wasso. We found our turnoff for Wasso and descended into town. It was not at all like the description in the guide book. Not a surprise really, not much of anything on this trip had been. The town was a dusty road flanked by small wood and mud buildings, much like most of the towns we had visited. We traveled all the way through without being able to locate a gas station or food store, so turned around and headed back. The usual "guys standing around" watched us curiously; this area is not often visited by tour groups, and I assume even more rarely visited by individuals traveling without a guide. We couldn't see any sign of a modern-type gas station, so we pulled over and asked a group of guys gathered in front of a restaurant. "Fuel? Over there!" they pointed right across the street to a hut surrounded by 55 gallon barrels. Hmmm. We were told not to get fuel anywhere but a regular pump type station. There wasn't anything like that here. We had about 200 kilometers of road before the next fuel stop and maybe a little extra thrown in for exploration around Lake Natron. We didn't have any choice; we crossed our fingers and hoped this guy was on the up and up. Fill 'er up! Fuel station in Wasso. We pulled in front of the hut and the guy asked us how much we needed. (This required running back across the street and asking for a translator.) A guy on a motorcycle volunteered to come over and help us with the transaction. Mark had to do some quick figuring; we had to fill the tank, but since our fuel gauge had been stuck on full the entire trip, we had to not only calculate how much we'd need to get where we were going, but how much we had used so far. Luckily, we'd been tracking our fuel usage since Ngorongoro, and figured we needed about 20L. 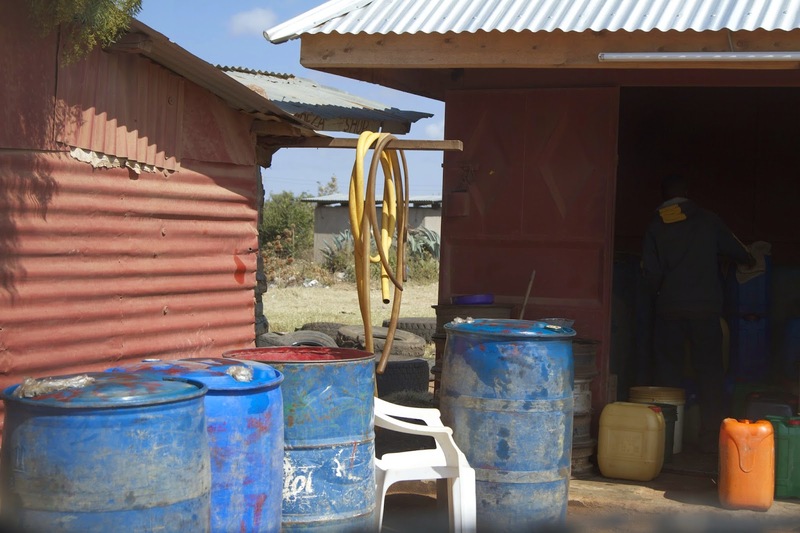 The fuel man stuck a piece of hose into the diesel drum and started hand cranking a pump he had clamped onto it, filling a jerry can to the 20L mark. He then put a funnel with a filter attachment into the car fuel filler and emptied the jerry can into our tank. This would have given the California Air Quality Board (not to mention OSHA) fits, but you know what? This is what ingenuity looks like. When you don't have electricity you have to make do. It saved our butts and made him a little cash: everyone was happy. Off we went down the road through town for the second time, this time on a quest for food. There were little stores here and there, but it was hard to tell who was selling what. We pulled over at what would amount to a mini strip mall in the U.S., a line of shops with crates of empty Coke bottles lined up outside. There were boxes of dusty produce on display outside one of the doors, and as we looked it over a woman walked out to help us. We weren't sure what some of the items were, but picked up a bunch of bananas and a few beat up oranges. "Water?" we asked. "No water. No." We peeked inside the shop and saw three 500ml bottles on the shelf, which wouldn't have been enough for us anyway, and decided to let it go. We paid for our fruit and got back on the road, stopping briefly to help push start a disabled car (we wanted to leave a good impression for the next hapless white folks who happened to stumble through.) 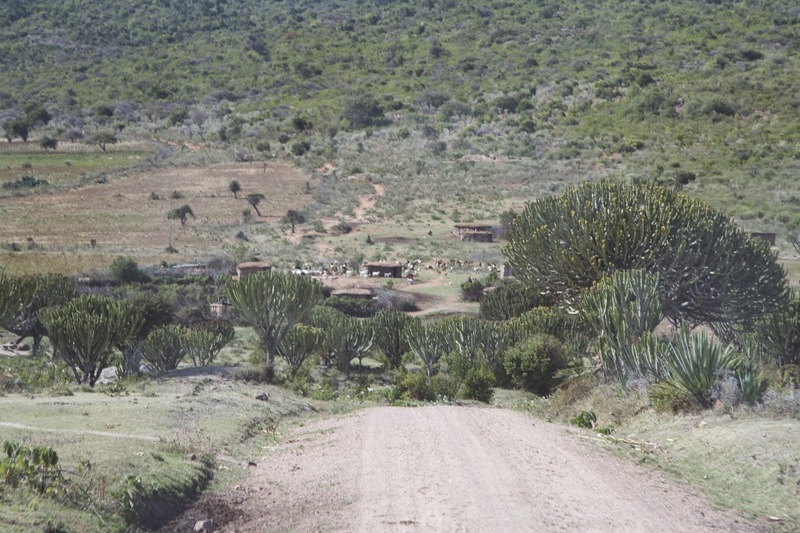 On our way up the hills outside of town the terrain turned from lush and green to dry and gray with the occasional candelabra tree. 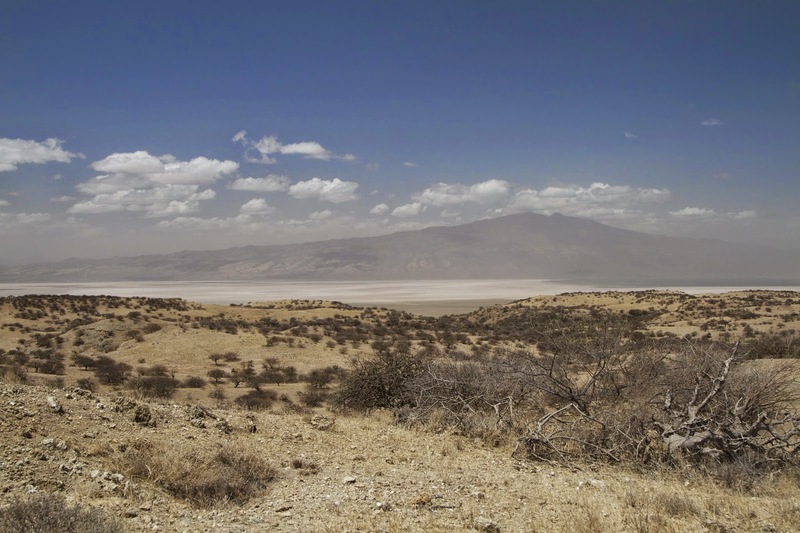 We were moving into the desert region of the Nguruman Escarpment, the edge of the Lake Natron valley area. It was hard to tell on these bumpy roads, but we were starting to get a distinct wiggle in the steering. On the sporadic occasion of a smooth stretch of road Mark would accelerate from our normal 25-30 mph to 40-45. The car would be fine up until we hit a bump, at which time the steering wheel would wiggle back and forth until he slowed back down to 20. It could be the alignment was off—God knows we hit enough rocks and corrugation to do it—but to be extra sure it wasn't something more serious we pulled over to check it out. First we checked the tires to make sure we didn't have a flat, then popped the hood. There was a little leak coming from the power steering box, but it didn't look too major. Mark topped it off and couldn't find anything else that seemed amiss. Just have to keep an eye on it. When we started the car up again I turned the GPS back on (the GPS unit relied on the car for power.) It booted back up and I was pulling up our route when the unthinkable happened: after letting out a forlorn beeping sound, the screen went black. Ok, not a huge deal. The cigarette lighter power connection had been jiggling around the whole trip so I figured it had come a little loose. I pulled it out then plugged it firmly back in. No go. I did the same with the cord connection to the device. Nothing. I jammed the "ON" button down so hard I had the button imprint on my index finger for half an hour. No dice. If this had happened anywhere else, it would have been acceptable. Tarangire? No worries, we had a map. Ngorongoro? We had a guide and plenty of other people around to ask. Serengeti? There were signs, and if we were truly lost, someone would be along within the hour. We had only seen one other vehicle since we left town, we didn't have a road map that covered this area, there was no cell service and to top it off, we were starting to suspect there was something wrong with the steering. So, as one of our favorite instructors at Overland Expo had taught us, when you are presented with a problem that is giving you trouble, stop and make a cup of tea. The truck was still running great, the steering was a bit off but if we kept our speed down it didn't seem to be a problem. We decided to push on and try to navigate using the description in the guide book. What could happen? We traveled for two more hours through terrain that was getting increasingly dry and rocky. Must be getting close to the Nguruman Escarpment! The road had been easy to follow for the most part; there were very few other side roads up here. We descended into a little valley and crossed a dry riverbed, Mark navigating the sandy wash with ease (Serpentine! *) when "BEEP!" a cheerful little sound from our GPS announced it had decided to work again. After pulling up our route on the screen it confirmed we were still on the right track. Hallelujah! At the bottom of a hill we came to a fork in the road, both directions looking equally "main." This turnoff wasn't mentioned in the book, nor was it marked on the GPS. Two Maasai women were sitting by the side of the road, one nursing a baby. I rolled down my window and smiled at them "Jambo!" They smiled back and walked over to the car, laughing and nodding at me. I asked them with lots of hand signals and gestures which way to Natron? Puzzled looks and shaking heads. I pulled out a map of Tanzania, pointing to the lake and where I thought we were (approximately.) They looked at the map and smiled, with looks that indicated they probably hadn't seen a map before. I'm not even sure they knew how to read. And I'm pretty certain they didn't know Kiswahili either, based on the way they said hello. The baby gurgled and smiled at me, not sure what to make of this strange looking (and sounding) woman. Just at that moment two safari vehicles drove around the corner. Mark waved one of them down and yelled "Natron?" The guy nodded and pointed back the way they had come. "Yes, that way. Right turns! All right turns and you will get to Natron!" It had been confirmed. We were on the right track. Looking down onto the Lake Natron plain.